Flicker Alley, in partnership with Universal Pictures, are proud to present Universal Pictures’ new 4K restoration of the 1928 silent classic, The Man Who Laughs, accompanied by a newly recorded orchestral score by the Berklee School of Music. Based on the novel by Victor Hugo, the story centers on the extraordinary adventures of Gwynplaine (Conrad Veidt), whose wide and mirthless grin inspired DC Comics’ legendary Batman villain, the Joker. Veidt's character has become well known to most cinephiles. Orphaned as a child, Gwynplaine is punished by the king for his father’s transgressions by having his face carved into a hideous grin. Disfigured and alone, Gwynplaine rescues a blind girl named Dea (Mary Philbin), and both end up starring in a sideshow where they fall in love. Because she cannot see, Dea does not know about her lover’s tormented grin. Masterfully directed by Paul Leni, The Man Who Laughs marks Leni’s penultimate work. Having grown up in Germany during the era of Expressionism, Leni embraces haunting characters, twisted sets, harsh angles, and deep shadows. Heralded as one of the best American silent emulating German Expressionism, The Man Who Laughs presents Leni at his creative directorial peak. Originally released silent, the film was enough of a hit for Universal in 1928 that the studio released it with a synched musical score using the Movietone sound-on-film process, presented here as a secondary audio track. 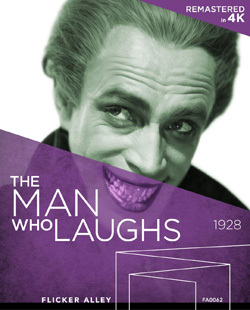 Part of Universal Pictures’ ongoing silent restoration initiative, The Man Who Laughs honors the studio's rich film history that has spanned more than a century. The primary source element for this restoration was a 35mm composite fine grain from the Universal Pictures vault, created in 1954 from the nitrate original camera negative. NBCUniversal's restoration team was able to stabilize and deflicker the film, as well as repair scratches, warps, and dirt. The 4K digital restoration was completed by NBCUniversal StudioPost. Paul Leni and The Man Who Laughs: A visual essay by film historian and author John Soister on Leni’s work at Universal during this period. “Celebrating Universal’s Masterpiece”: A new booklet essay written by renowned film historian and author Kevin Brownlow. “Notes On the New Score”: A short essay by composer Sonia Coronado of the Berklee School of Music on their new score for The Man Who Laughs. Optional Secondary Audio Track: In addition to the new Berklee School of Music score, the film’s original 1928 Movietone score presented here as a secondary audio track. Rare Image Gallery: A slide show presentation of vintage marketing materials, trade ads, memorabilia, and more from The Man Who Laughs, courtesy of the Reel Heroes of Film.